Councillor Mike Layton says the community meeting was meant to be about park safety, not alcohol. 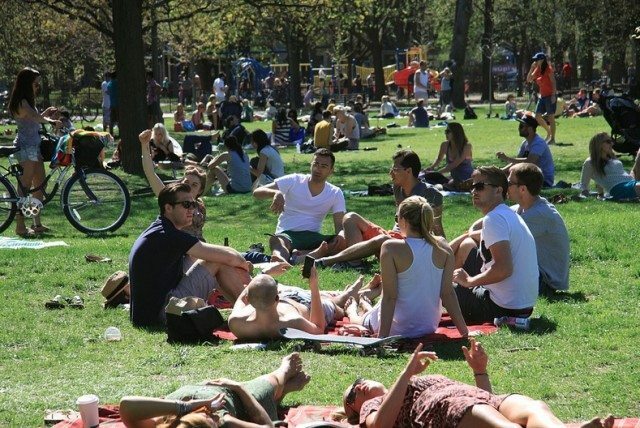 Trinity Bellwoods Park has become one of Toronto’s favourite warm-weather drinking spots. Photo by Sue Holland from the Torontoist Flickr Pool. Instead over 100 people showed up after the meeting was billed as “A Meeting to Discuss Alcohol Consumption in Trinity Bellwoods Park” on both social media and posters that popped up around the neighbourhood. Several media outlets then ran with the story, and within a couple days, the meeting really had become a discussion that was largely about park drinking. “It’s good to have these big discussions about things, and it’s good that people are interested in their community,” said Layton. Part of the story leading up to the meeting had been a police initiative called Project Green Glasses, which was described as an upcoming crackdown on park drinking in the western half of downtown, particularly in Trinity Bellwoods, Christie Pits, Bellevue Square, Dufferin Grove, and Alexandra parks. Superintendent Mario Di Tommaso, who was at the meeting representing Toronto Police Services’ 14 Division, said much of that was hyperbole. After representatives from the police and parks department explained their role in maintaining order in the park, meeting attendees were split into groups and asked to come up with ways the park could be made safer. Only a few seemed to be in favour of tougher enforcement. Most said they wanted the police to focus more on stopping problem behaviour, rather than simply ticketing park goers for having an open beer. More washrooms and litter receptacles were also popular suggestions. Some people wanted to see change on a larger scale, and suggested amendments to both provincial liquor laws and City bylaws. While some of the suggestions seemed difficult to act on—many people just wanted a Hamsterdam-style zone of tolerance, while others were pushing for “personal drinking licences”—Layton said that there were still a lot of good ideas brought forward. He added that he hopes Trinity Bellwoods can be a model for the rest of the city in how it deals with these issues.